Describe your company in under 50 words. Monash University Publishing combines a traditional concern for rigorous, open-minded scholarship and editorial precision and quality, with a contemporary sense of style and confident position within the digital age. What book did you launch with? We launched with three, in September 2010: A Companion to Philosophy in Australia and New Zealand, edited by Graham Oppy and Nick Trakakis; Closing the Gap in Education? Improving Outcomes in Southern World Societies, edited by Ilana Snyder and John Nieuwenhuysen; and Australians in Italy: Contemporary Lives and Impressions, edited by Bill Kent, Ros Pesman and Cynthia Troup. Five staff and we outsource a lot of editing, indexing, proofing and some other tasks. What makes your small press unique? Hopefully there is or will develop around the press a particular identity arising out of its publishing focus and the quality of what we produce. I am honoured to work and share a publishing vision with our series editors Clinton Fernandes (Investigating Power), Melinda Harvey (Contemporary Australian Authors), Julian Millie (Vernacular Indonesia), Luke Morgan (Art History), Jemma Purdey (Herb Feith Translations), Sean Scalmer (Australian History), and Marika Vicziany (Monash Asia Series). As publishing is ultimately the art of divining what is a good and important book and what is not, and working to convince others to share your view, our work together commissioning, editing and marketing books is what gives the press its strongest claims to being unique. In terms of sales, Maestro John Monash: Australia’s Greatest Citizen General by Tim Fischer, which has sold around 10,000 copies; in terms of intellectual and cultural impact, probably The Two Frank Thrings by Peter Fitzpatrick, which won the National Biography Award for 2012, or Meredith Fletcher’s Jean Galbraith: Writer in a Valley, which won the major Victorian Community History award last year; and in terms of policy and politics, perhaps Northern Lights: The Positive Policy Example of Sweden, Finland, Denmark and Norway by Andrew Scott, which has provoked much public discussion and is now being cited positively in works on future policy directions for Australia, such as Ian Lowe’s The Lucky Country? Reinventing Australia. Working as a team to develop optimal systems while maintaining a high level of output. Which book by another small press do you wish you’d published? Many, but one that comes to mind is Joel Deane’s Catch and Kill: The Politics of Power (UQP). Deane is a writer who impressively follows Aristotle’s dictum: ‘To write well, express yourself like the common people, but think like a wise man’, or person, as I’m sure he meant. In May we’ve got How to Vote Progressive in Australia: Labor or Green?, edited by Dennis Altman and Sean Scalmer, and Frank Vajda’s Saved to Remember: Wallenberg, Budapest 1944 and After. 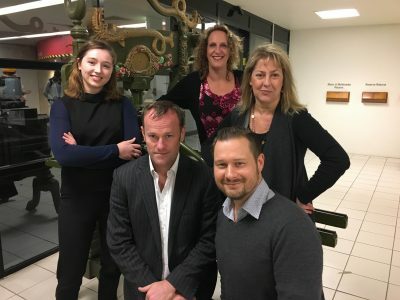 Pictured from left: Laura McNichol Smith (production assistant), Nathan Hollier (director), Joanne Mullins (coordinator), Sarah Cannon (marketing coordinator) and Les Thomas at front (designer).